Many shippers are exploring intermodal shipping and freight options to move their volume freight more efficiently, while maintaining strong transit times. 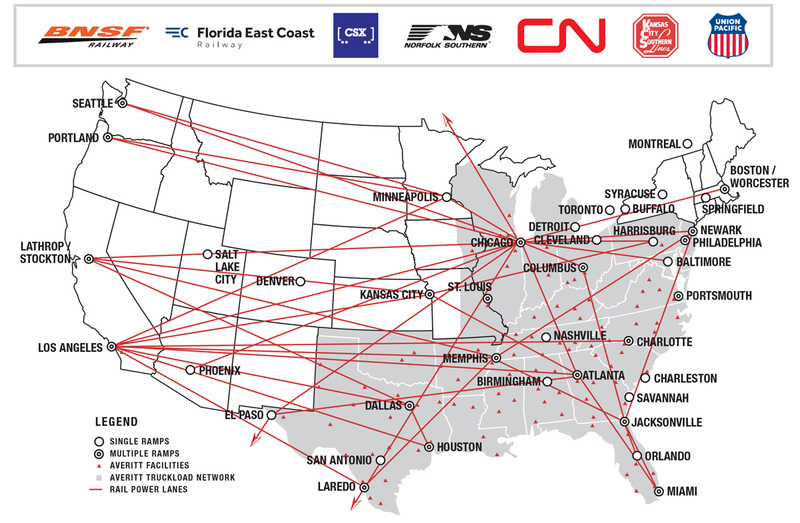 That is why Averitt is now providing world-class intermodal services through preferred relationships with the nation's leading railroads. For three decades, Averitt has built a reputation for providing world-class transportation. You can trust us to extend "Averitt-style" reliability, consistency and professionalism to our intermodal shipping service. Whether it's over-the-road or on the rail, our promise says, "On time, on target, intact!" Working with a single provider who can handle multiple facets of your shipping saves you time, money and headaches. We can bundle our intermodal services together with our LTL, truckload, international ocean/air, warehousing, PortSide® and leading-edge transportation management technology to bring you the ultimate value for your transportation dollar. No one else in the industry can do that for you! Our 100+ facility LTL distribution network and our 1,400+ unit over-the-road fleet help provide you with operational and pricing flexibility you can't get anywhere else. We can react more quickly than other intermodal shipping and freight providers to sudden shifts in your needs – even with shipments already en route. At every point in the process, Averitt professionals are actively involved in making certain your shipment arrives on time and intact. Leave the management of equipment reservations, pickup and delivery drayage, rail billing and linehaul to us.